The Nihon Ki-in launches `Go Books'! 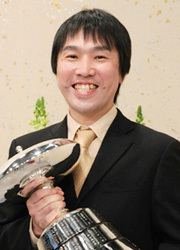 Yamada Kimio 9dan wins NHK Cup for his first time. Master's Cup: Who are Semi-finalists? Xie Yimin has successfully completed her defence of her triple crown of Women's titles. 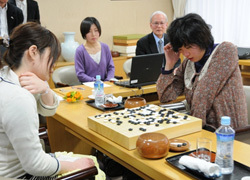 In the 23rd Women’s Meijin title match, she rebuffed the challenge of Mukai Chiaki 4 dan who attempted to gain the title. Now she has got her 11th title and sets the women’s new record. The Weekly Go Newspaper published by The Nihon Ki-in has been released on i-pad since April 2011! Now you can read it on i-pad as well! The Nihon Ki-in will also plan to release e-publications for its monthly magazine (`Go World') and variety of books. The finalists of the 58th NHK Cup were Yoda Norimoto 9dan and Yamada Kimio 9 dan. Yoda 9dan played in the final of NHK Cup for his six times and won the tournament for five times while Yamada 9 dan never played at the final of NHK Cup before. In the final, Yamada (Black) defeated Yoda by 6.5 points. Both Yamada and Yoda will be qualified to play in Asian TV Cup tournament this summer. Ishida Yoshio, Kobayashi Koichi, Cho Chikun and Kobayashi Satoru have reached the semi-final of 1st Master’s Cup tournament. They will play for the semi-final match in June 2011.